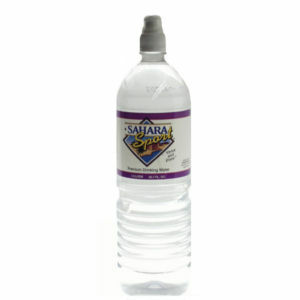 Sahara Sport Premium Water in the 1.5 liter presentation is bottled in the mountain base City of Redlands. This bottle has a sports cap that allows the consumer to push the tip up or down and keep the contents fresh and easy to drink while you are driving , hiking or simply relaxing by the pool or beach. This large size bottle is very handy to keep in a backpack or in the trunk of your car for emergencies. Sahara water is a great tasting water that will satisfy your thirst.